Just before our travels Jane and I did some garage saling, and we hit up an estate sale. Jane always rides in the Ergo backpack for that, which is infinitely easier than chasing a toddler through someone's home filled with breakables for sale. But it makes for some achy Mama back if we take too long. Usually we do a quick walk through and leave. On this occasion Jane also pointed out every teddy bear in sight with a top-of-her-lungs shout of "BEAR!" Oh me. 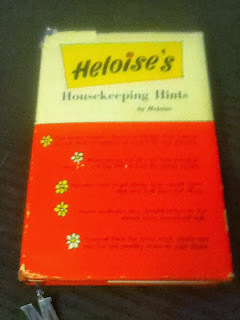 We got a few things overall, but my favorite was probably the Heloise's Housekeeping Hints book, 1962 edition. I read it in a couple days, intending to come back and try some of the tips. It was unintentionally hilarious, basically the dated language and ideas of women vs. men made me laugh. A particularly funny-to-me passage was about splurging on a piece of ham every month. "No husband understands that ham costs more than hamburger!" LOLOLOL. Finely crushed ice: Rinse out a two-quart plastic milk carton, fill with water and store in the freezer. "When ready for that finely crushed ice, remove one or more cartons from the freezer. Next--and this is the trick--take the cartons to a solid concrete sidewalk or patio. Holding onto the carton, slam it against the cement on all four sides until it quits going 'crack' and starts going 'thunk.' Then open the top and pour out the finest crushed ice you havve ever seen It's amazing!" 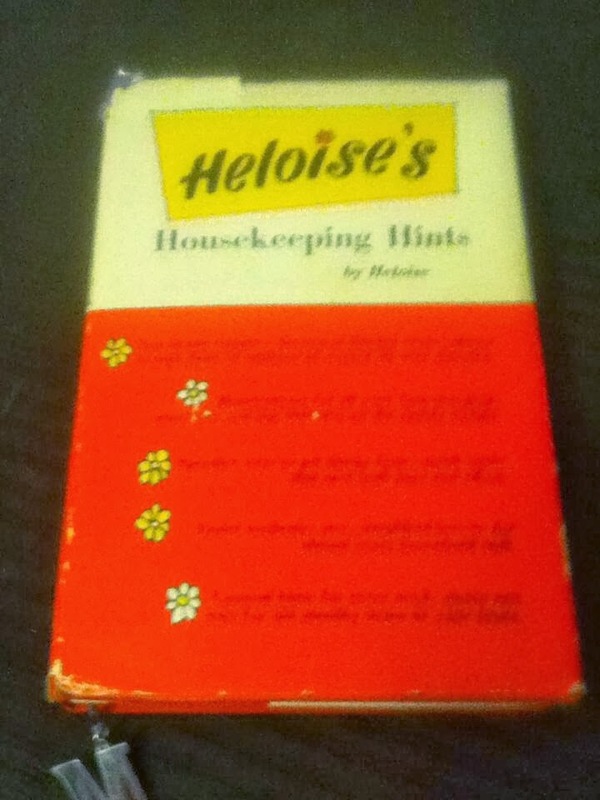 "Dip a raw potato into scouring powder to scrub the corners of rusted cake and pie pans." From Louisiana: "I am surprised that people don't know how to clear the air in the bathroom by striking matches. Floral deodorizers are fine in the summer, but in winter, with heat on, they just don't mix for us." I'm sure there are more but I didn't mark them when I read through the first time. I know I laughed at a part where she wrote about "the old man" liking things a certain way. And the way laundry was done then vs. how I do it now is like night and day. I really have it easy! Do you have any good household tips? Or have you been to any good garage sales lately? What a wonderful find. I was alive then! Can you imagine doing laundry with a ringer washer, hauling water... We really do have it easy. Wonder what doing laundry will be like in another 50 years.